“I’ve got my life in a real mess and I need your help bad,” reads the intro of Matthew Schaefer’s Toyota Land Cruiser Craigslist post. He says his girlfriend of six years left him a few weeks ago, and now he’s stuck alone in the mountains of California without a job, a driver’s license or gas money. He needs someone to buy his truck, and quickly. The post’s title “Emergency Sale 1992 Toyota Land Cruiser FJ80 4x4" sounds just like your typical Craigslist listing from someone short on cash, but the body of the ad tells a fascinating, tragic story of a man way down on his luck. Admittedly, this whole post seemed almost too dramatic to be true. Plus, it’s Craigslist. So I called up the seller and his girlfriend, and—in what were some of the most interesting interviews I’ve ever conducted—I learned all about Schaeffer’s story. Understandably, Schaefer, a 34 year-old Missourian who had moved to Las Vegas a few years ago before decided to live out of a Toyota Land Cruiser with his girlfriend, seemed embarrassed when I read parts of his own post back to him. 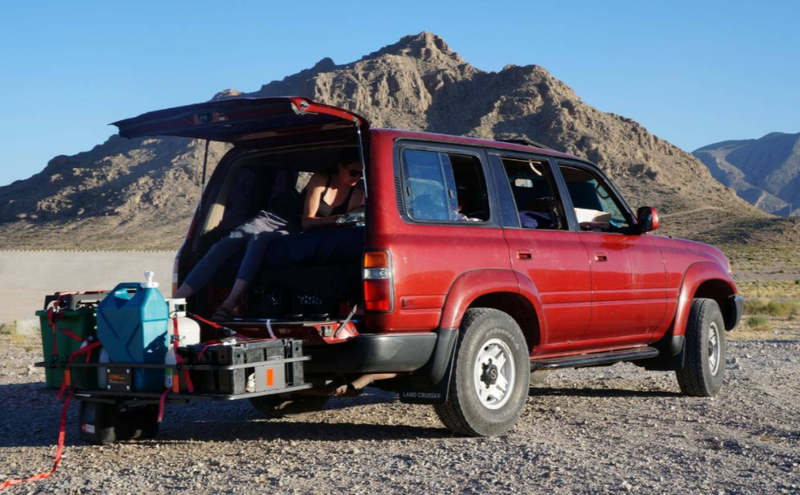 Inspired by traveling YouTubers like Nomatic Fanatic and AdventureVanMan, Schaeffer and his partner Sarah Lacefield left their day jobs (he sold fragrances, she worked in retail), sold their Honda Civic, and headed west in a Toyota Land Cruiser they had purchased from a highway patrolman. So on June 4, the couple drove up north to Oregon, and found “work camping” jobs at an RV park called Lemolo Lake Resort. They stayed there for two months doing housekeeping work, but eventually the seasonal job came to an end. After trying to find work on the coast of Oregon, Schaefer says he and Lacefield “ended up going broke,” and decided to drive to Quartzsite, Arizona to meet up with hundreds of other “van-lifers,” who they said were planning to spend the winter there. On the way, Schaefer and Lacefield stopped by San Francisco to take a job installing Christmas decorations, but the job—and the fact that they couldn’t find a safe place to park the Land Cruiser with her dog in it—didn’t work out at all. It was at that point two weeks ago (or six months after the couple started its grand adventure), Lacefield told me, that she could no longer take the nomadic lifestyle. She broke up with Schaefer, and got on an airplane in Reno headed back to her parents’ house in Missouri. But Schaefer didn’t go back to Missouri with Lacefield. He decided he wanted to trudge on to Quartzsite, Arizona. First, though, he had to try to get his driver’s license in Nevada, since that’s where they had lived before the trip. When that didn’t work out due to his lack of proof or residency, Schaeffer drove to Bishop, California to clear his mind. He figured perhaps he could get a job in the beautiful town, and everything would be OK. But finding a gig has been tough, the weather has been frigid at night, and now Schaefer has had enough. He wants to sell his Land Cruiser before full-blown winter arrives so he can move in with a friend in Oregon, and get his life back on track. Right now, Schaefer says he’s running low on funds. He’s got no driver’s license, his insurance payment is due in two weeks, and he’s also got a cell phone bill coming up. Taking care of those issues would leave him with no money for gas, which is why Matt is selling the Land Cruiser from where it sits. I could sense emotion in his voice when he told me about what prompted his realization that he needs to make a change now. He told me driving without a license is just too scary, and that his lifestyle has become lonely. He’s just in a bad spot, and wants to sell his Land Cruiser, get up to Oregon to split rent with his friend, and plan the next chapter of his life. That chapter, Schaeffer told me, will include heading back out into the open road. He said: “I think I could tackle this idea again, but with some better planning.” That better planning means he’ll focus more on stopping in cities that have job opportunities, and less on driving places he wanted to visit for fun. Speaking of the Land Cruiser, it actually seems like a surprisingly solid deal. Schaeffer is asking $3,800 for an SUV he says he spent $6,000 on less than a year ago when he bought it from the second owner. You can read about the truck’s faults in the Craigslist post, but they all seem relatively minor, and Schaeffer even fired up the engine over the phone so I could listen. Unless he was playing a YouTube video or firing up a different car, it appears that the FJ80 runs, which wouldn’t be surprising for a vehicle as un-killable as a Land Cruiser. Especially one with only 173,100 miles. Schaeffer has tried selling the vehicle on a Land Cruiser Facebook group, but he told me they just laughed at him, and accused him of being a scammer. I don’t get that sense after talking to him, and $3,800 seems like a pretty paltry amount to run a scam for. And if nothing else, this could end up a good deal for someone—and maybe for Schaeffer too.